The Damnoen Saduak Floating Market in Thailand is situated at Damnoen Saduak District, Ratchaburi Province, about 105 kms from Bangkok. According to history around 1866 King Rama IV ordered that a 32 kms long canal be constructed at Damnoen Saduak. The canal would then connect the Mae Klong River with the Tacheen River. 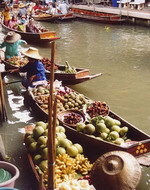 The Damnoen Saduak Floating Market is a highly attractive place for visitors to see the old style and traditional way of selling and buying fruits and vegetables from small boats. Visitors will also be able to view traditional Thai houses in addition to the way the local inhabitants live and travel in traditional boats.It is recommended that tourists take a short boat ride to view the wonderful smells and sites of Damnoen Saduak floating market.